Perhaps one of the most familiar pieces of classical choral music is the “Hallelujah Chorus” from The Messiah. We often hear this chorus performed around Easter and Christmas (and sometimes at comical lightbulb moments in movies and sitcoms). The first time I performed the “Hallelujah Chorus” was as a high school freshman playing oboe in the school orchestra, and I have performed this piece either in the orchestra or the choir many times since. I still like it. I’m not the only one, either: this chorus has remained popular for more than 200 years. 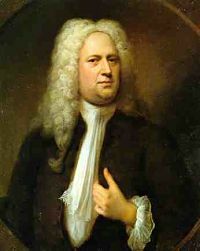 “The Hallelujah Chorus,” as we know it now, is part of a much larger work by Georg Frideric Handel, first performed in 1741. The Messiah is an oratorio composed in three parts, all about the life of Christ. An oratorio is similar to an opera in that a story is told through music, with recitatives to share a lot of information, and choruses to expand musically on the grander ideas to be expressed in the work. Unlike an opera, however, an oratorio is performed without elaborate costumes and staging. In The Messiah, the words primarily come from the King James version of the Bible. You can see the libretto with scriptural references here. The work is in English, but that doesn’t mean it is easy to sing. It still feels like quite a workout to perform this work, especially when singing several of the choruses in a row. Performing The Messiah can be a challenge for many choirs! In the context of the entire oratorio, “The Hallelujah Chorus” comes at the end of the second part, which is devoted to telling about the Passion of Christ. In fact, the oratorio was first meant to recognize and celebrate Easter, although we often hear it performed around Christmas time these days. “The Hallelujah Chorus” recognizes the glorious end of the Passion story with equally glorious music. This glorious music, in turn, is perfect for Easter celebrations. One final interesting tidbit about “The Hallelujah Chorus” is that traditionally, everyone stands when the chorus is played. The reason why is kind of funny in retrospect: at a performance in 1743, King George II of England was in attendance. When “The Hallelujah Chorus” began, the king stood up. Why? We don’t really know – maybe he needed to stretch his legs, or maybe he mistook the opening notes for the national anthem. In any case, you had to stand when the king stood, so everyone in the audience followed suit. We’re still following the king’s example today. The music is rich and full of energy, from the voices of the chorus to the strings and winds in the orchestra. Energetic music can inspire energy, for getting out of bed, cleaning the house, or doing exercise. This song works well as a “soundtrack song.” Surely you have moments to celebrate, when things finally work out the right way, don’t you? You could pop this song to solidify the joy of that moment. This song carries important theological and spiritual meaning for Christians. If Christian faith is important in your life, then this song can be very important, whether you hear it performed in a concert hall by professional musicians, or you listen to a recording with your loved one at the nursing home. This song says, “Easter,” so it supports the celebration of that special holiday. What do you think of the “Hallelujah Chorus?” Have you performed this piece? What comes to mind when you hear it? This piece was used as the recessional for my wedding. No one stood, though, perhaps out of surprise. I remember my grandmother wondering aloud why everyone remained seated. Wen I clicked on the link, it started me at the beginning of the video. Do you have a time marker for your grandma?